BOSTON, MA - Boston Bruins General Manager Peter Chiarelli announced today, June 27, that the club has promoted Scott Bradley to Assistant General Manager and Ryan Nadeau to Director of Hockey Operations/Analytics. 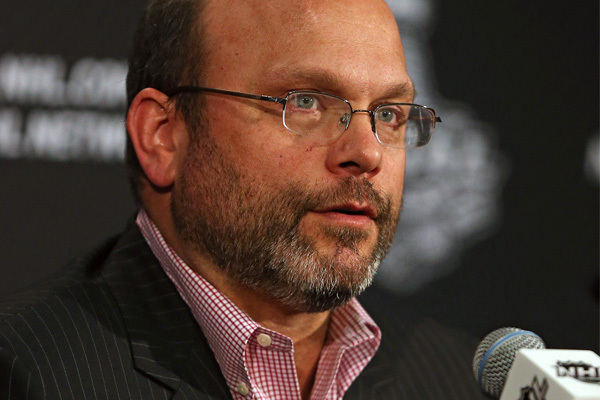 Chiarelli also announced that the team has hired John Ferguson as the Executive Director of Player Personnel. Scott Bradley will enter his 22nd season with the Bruins organization, after spending the previous five campaigns as the Director of Player Personnel. As Assistant General Manager, Bradley will serve as an advisor to Chiarelli on all matters pertaining to player evaluation, trades and free agent signings, in addition to assisting the General Manager in overseeing all individuals in their specific duties for the Bruins. A native of British Columbia, Bradley played part of one season as an American Hockey League goaltender and then coached for five seasons with the Tier II Junior A and Senior AAA League teams in Abbotsford, BC, including an Allan Cup championship squad in 1989-90. Bradley also served for three seasons as a scout for the WHL's Seattle Thunderbirds before joining Boston's scouting staff on a full-time basis in 1993-94. As Executive Director of Player Personnel, Ferguson will be responsible for scouting at both professional and amateur levels for all Bruins personnel, including club prospects and current roster players. Ferguson will also assist and advise Chiarelli in evaluating potential trades, signings and other club transactions in his role. Ferguson joins the Black & Gold from the San Jose Sharks where he served as the Director of Pro Scouting. Prior to the Sharks, Ferguson served as the Vice President and General Manager of the Toronto Maple Leafs from 2003-2008. Preceding Toronto, Ferguson served as Assistant General Manager as well as Vice President and Director of Hockey Operations for the St. Louis Blues. As a player, Ferguson was drafted in the 12th round (247th overall) by the Montreal Canadiens in the 1985 NHL Entry Draft and played four seasons as a forward (left wing) at the American Hockey League level, appearing in 209 games (Sherbrooke Canadiens 1989-90, Fredericton Canadiens 1990-92, New Haven Senators 1992-93) tallying 41-50=91 totals. Preceding his time in the AHL, Ferguson played collegiate hockey for three seasons at Providence College (Hockey East) from 1985-89. Nadeau finished his 11th season in the Bruins organization and eighth in the hockey operations department. As Director of Hockey Operations/Analytics, Nadeau will continue scouting college prospects in the Eastern United States and Canada. Nadeau will utilize specialized statistical and numerical data/tools to supplement scouting efforts and evaluation, in addition to other hockey ops duties.